1. 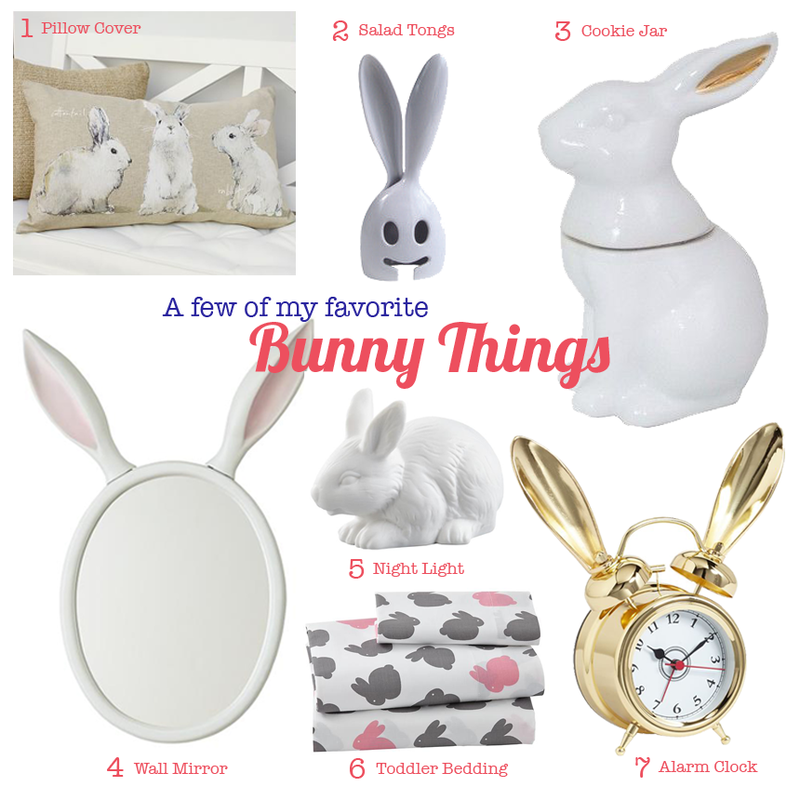 Bunny Pillow Cover - This would be cute on a front hall bench, this time of year or in a little girls room year round. 2. Salad Tongs - Now these are actually kind a scary looking, but also a great conversation starter during Easter brunch. 3. Cookie Jar - This one has shown up on a lot of blogs these past few weeks, but I think it warrants another mention. The all white color with the hint of gold is just so pretty. 4. Wall Mirror - I have to say I am trying to figure if there is a place in my house for this now. I realize it's probably meant for a kids room, but I love it for me. 5. Night Light - I am a big fan of lighting and whether or not you need a night light to ward off scary dreams, the warm, soft light is always so cozy and relaxing. There are other woodland animals available, too. 6. Toddler Bedding - This comes in crib size, too. Very sweet for a nursery or a young girl. 7. Alarm Clock - I LOVE this clock! It's so "Alice in Wonderland" and I'm considering it for my own bedside table. Available in a few different finishes. So there you have it. A little fluff reading (pun intended) for your holiday weekend. I'm working on some more in depth content, promise, for upcoming posts, so be sure to check back. where did you buy the wall mirror from?